1 Known in Judah is God, In Israel is His name great. 2 And in Salem was His tent [pitched], And His dwelling in Zion. 3 There He shivered the lightnings of the bow, Shield and sword and battle. Selah. 4 Effulgent art Thou [and] glorious From the mountains of prey [everlasting mountains?]. 5 Spoiled are the stout of heart, they slumber [into] their sleep, And none of the men of might have found their hands. 6 At Thy rebuke, O God of Jacob, Both chariot and horse are sunk in deep sleep. 7 Thou! dread art Thou, And who can stand before Thee, in the time of Thine anger? 9 At the rising of God for judgment To save all the afflicted of the earth. Selah. 10 For the wrath of man shall praise Thee, [With] the residue of wraths Thou girdest Thyself. 11 Vow and pay to Jehovah your God, Let all around Him bring presents to the Terrible One. 12 He cuts down the [lofty] spirit of princes, A dread to the kings of the earth. In contents and tone this psalm is connected with Psalms xlvi. and xlviii. No known event corresponds so closely with its allusions as the destruction of Sennacherib's army, to which the LXX. in its superscription refers it. The singer is absorbed in the one tremendous judgment which had delivered the dwelling-place of Jehovah. His song has but one theme--God's forth-flashing of judgment on Zion's foes. One note of thankfulness sounds at the close, but till then all is awe. The psalm is divided into four strophes, of three verses each. The former two describe the act; the latter two deal with its results, in an awed world and thankful praise. The second strophe (vv. 4-6) comes closer to the fact celebrated, and describes, with magnificent sweep, brevity, and vividness, the death sleep of the enemy. But, before it shows the silent corpses, it lifts one exclamation of reverence to the God who has thus manifested His power. The word rendered "Effulgent" is doubtful, and by a slight transposition of letters becomes, as in ver. 7 which begins the next strophe, "dread." In ver. 4 b the rendering "more excellent than," etc., yields a comparison which can scarcely be called worthy. It is little to say of God that He is more glorious than the enemies' "mountains of prey," though Delitzsch tries to recommend this rendering, by supposing that God is represented as towering above "the Lebanon of the hostile army of peoples." The Hebrew idiom expresses comparison by the preposition from appended to the adjective in its simple form, and it is best here to take the construction as indicating point of departure rather than comparison. God comes forth as "glorious," from the lofty heights where He sits supreme. But "mountains of prey" is a singular phrase, which can only be explained by the supposition that God is conceived of as a Conqueror, who has laid up His spoils in His inaccessible store-house on high. But the LXX. translates "everlasting mountains," which fits the context well, and implies a text, which might easily be misinterpreted as meaning "prey," which misinterpretation may afterwards have crept into the body of the text. If this alteration is not adopted, the meaning will be as just stated. Ver. 5 gives some support to the existing text, by its representation of the stout-hearted foe as "spoiled." They are robbed of their might, their weapons, and their life. How graphically the psalmist sets before the eyes of his readers the process of destruction from its beginning! He shows us the warriors falling asleep in the drowsiness of death. How feeble their "might" now! One vain struggle, as in the throes of death, and the hands which shot the "lightnings of the bow" against Zion are stiff for evermore. One word from the sovereign lips of the God of Jacob, and all the noise of the camp is hushed, and we look out upon a field of the dead, lying in awful stillness, dreamlessly sleeping their long slumber. The third strophe passes from description of the destruction of the enemy to paint its widespread results in the manifestation to a hushed world of God's judgment. In it anger and love are wondrously blended; and while no creature can bear the terrible blaze of His face, nor endure the weight of His onset "in the time of His anger," the most awful manifestations thereof have a side of tenderness and an inner purpose of blessing. The core of judgment is mercy. It is worthy of God to smite the oppressor and to save the "afflicted," who not only suffer, but trust. When He makes His judgments reverberate from on high, earth should keep an awed stillness, as nature does when thunder peals. When some gigantic and hoary iniquity crashes to its fall, there is a moment of awed silence after the hideous tumult. The last strophe is mainly a summons to praise God for His manifestation of delivering judgment. Ver. 10 is obscure. The first clause is intelligible enough. Since God magnifies His name by His treatment of opposing men, who set themselves against Him, their very foaming fury subserves His praise. That is a familiar thought with all the Scripture writers who meditate on God's dealings. But the second clause is hard. Whose "wraths" are spoken of in it? God's or man's? The change from the singular ("wrath of man") to plural ("wraths") in b makes it all but certain that God's fulness of "wrath" is meant here. It is set over against the finite and puny "wrath" of men, as an ocean might be contrasted with a shallow pond. If so, God's girding Himself with the residue of His own wrath will mean that, after every such forth-putting of it as the psalm has been hymning, there still remains an unexhausted store ready to flame out if need arise. It is a stern and terrible thought of God, but it is solemnly true. His loving-kindness out-measures man's, and so does His judicial judgment. All Divine attributes partake of Infinitude, and the stores of His punitive anger are not less deep than those of His gentle goodness. Therefore men are summoned to vow and pay their vows; and while Israel is called to worship, the nations around, who have seen that field of the dead, are called to do homage and bring tribute to Him who, as it so solemnly shows, can cut off the breath of the highest, or can cut down their pride, as a grape-gatherer does the ripe cluster (for such is the allusion in the word "cuts down"). 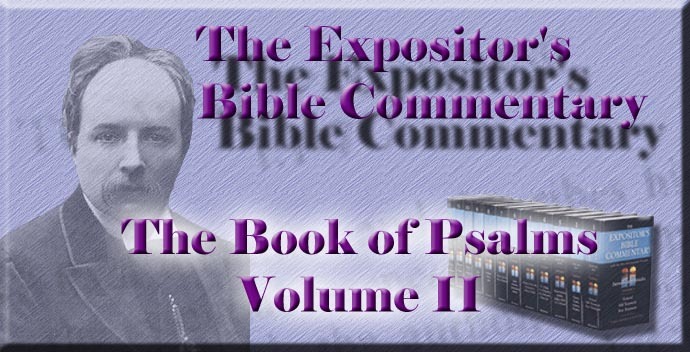 The last clause of the psalm, which stands somewhat disconnected from the preceding, gathers up the lessons of the tremendous event which inspired it, when it sets Him forth as to be feared by the kings of the earth.